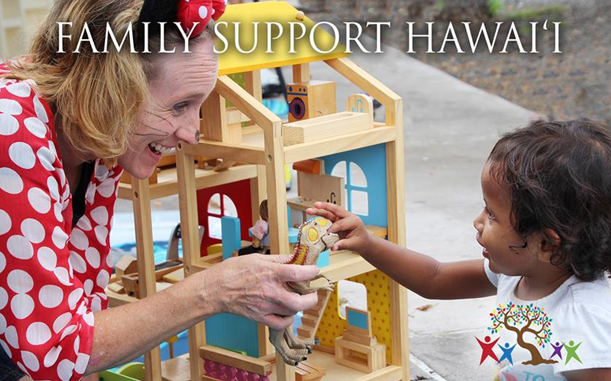 Each year new families reach out to Family Support Hawaii for services. First one, then two, and in less than a year, over 900 new families have received services from our programs. Our Early Head Start, Early Identification, Early Intervention and Home Visiting programs are vital to preparing our keiki for success in education and life. Our Fatherhood Initiative has been instrumental in strengthening the ability of men in the community to build strong bonds with their children. Please take a moment to read the success stories from our programs. A recurring theme in our agency’s work is that of partnership. Our staff and volunteers partner with families to carry out our mission, building knowledge and skills, strengthening attachments, widening options, and promoting healthy cooperation (partnerships!) among caregivers to nurture their children. Our agency also partners with other agencies in the community, as well as with individuals who might, for example, offer free services to children in our programs. We also partner with foundations and other grant-making organizations to expand the reach of our programs. One of our current big wins is our partnership with the Samuel N. and Mary Castle Foundation and the Henry & Dorothy Castle Memorial Fund, currently in year two of a possible three-year cycle. The partnership has allowed for the expansion of group socialization services that were provided in the past only to our Early Head Start families as a regular part of that program. Providing a space and time where children, who may otherwise be restricted, are free to run, play, and explore in safety; and caregivers can observe the joy this brings them. Families with children who have special needs. We were able to increase participation among Early Head Start families representing these three groups, and were also able to engage new families from our Early Intervention Services program (for children with special needs), and from our Fatherhood Initiative. The Castle grant also enabled the agency to improve participants’ experience by enhancing and enriching the food choices for children and adults (food is always a big draw). The program also was able to make available to families baby formula, baby food, and any needed special nutritional items, as well as age-appropriate diapers. This means that parents and other caregivers were free to just relax and know that the needs of their children would be met in community. Early Head Start (EHS) is an early childhood education program operated by Family Support Hawaii, serving expectant mothers and families with children from zero to three years of age. We operate two centers for infant and toddler care; the Kealakekua program serves working parents or parents who are continuing their education; the other, at Kealakehe High School, works with young parents who are students there. The bulk of EHS services, however, are home visiting services. EHS Home Visitors visit families in their homes, or at a mutually agreed upon location, and provide educational services and activities to enrolled families. EHS also assists families by ensuring that babies stay up to date on well-baby checks and immunizations, by performing regular screenings to ensure that babies are progressing in all areas, by getting families connected with other community resources, by helping to set and achieve family goals, and by assisting families in almost any way we can. Todd and his daughter, Erika, have been a part of EHS since 2015. Todd’s participation in EHS made a critical difference in his ability to promote the health and development of his daughter. “For every milestone my daughter has reached (breastfeeding, potty training, etc. ), EHS has been there,” he said. Nutrition was Todd’s biggest worry early in their participation with the program. Todd was concerned because Erika wasn’t very interested in eating, and the foods she did want were mostly unhealthy. His Home Visitor encouraged Todd to try different options such as mixing fruits into a smoothie and adding cauliflower into mashed potatoes. Erika now loves mashed cauliflower – it doesn’t even need to be mixed in with mashed potatoes anymore! Todd reports he felt like he had a whole team of people behind him, supporting him and giving him confidence as a parent. Our Child Development (early intervention) Program provides services for children from birth to three years of age with special needs and their families. Specialists support parents in helping their child develop in all areas of development. Once a child is determined eligible, they receive services based on an Individualized Family Support Plan (IFSP). Through this process the team, family included, will work on outcomes based on by the needs of the child and concerns of the family. Jakoby is an adorable 32-month old boy who was originally referred to the Child Development program by his pediatrician after his 24-month Well Child visit identified concerns of a speech delay. He is an energetic toddler and has an infectious smile! At the time of referral, Jakoby really wasn’t talking, with only about ten recognizable words, and he had a very difficult time communicating his wants and needs effectively. After getting to know this child’s parents, it was clear that both mom and dad were very much on the same page as far as providing consistency with regard to their parenting style. From the very first meeting, mom was literally taking notes and it was clear that she was serious about doing whatever it takes to help Jakoby succeed and thrive. Within a matter of one or two sessions with our Speech/Language Pathologist and our Developmental Specialist, Jakoby was already starting to show interest in using sign language to communicate his basic needs. Mom was utilizing strategies to help get Jakoby’s attention by getting good eye-contact before talking to him or asking him a question. Now, six months into services, Jakoby is effectively communicating needs such as being hungry or wanting a cup of water, frequently signing two word sentences! Jakoby also had some difficulty regulating his behavior based on certain environmental sensory information. Jakoby would often become agitated and somewhat aggressive in instances where there were a lot of people or commotion around. Jakoby had a difficult time being able to be calmed even by his parents in these instances which became quite difficult for his parent when out at family gatherings or in public. With the some additional information obtained from a sensory profile by our occupational therapist, and with the assistance of a behavioral instructional consultant, the team was able to provide the family with some additional strategies to help regulate Jakoby’s behaviors. Jakoby’s parents are now taking him consistently to Baby Steps where he is able to interact and engage in parallel play with his peers. This family has been such a success story for Early Intervention because they represent the ideal model for our program’s design. Both mom and dad have worked very hard to implement the strategies from the service providers. They have taken notes, asked questions, and advocated for their child. It is clear to all who have been in the home that Jakoby has made significant strides with regard to his development. July marked the first collaboration between Family Support Hawaii’s Fatherhood Initiative and Kona Moms for our launch of the Kona Talk Story Event. This event provided families a dinner and movie night, with activities for the kids, giveaways for moms and dads, and a screening of the Pixar movie “Inside Out.”The evening provided a fun opportunity for a great conversation about emotional intelligence and what’s going on inside the little heads of children. So, what is going on inside their little heads?A whole lot, it turns out. Like us adults, they filter all of their sensory experiences through their emotions. How doesthismake me feel?Is it okay to feelthis?What happens when I express myselfthisway?How we respond as parents influences how our children approach future, similar experiences, and so we need to be mindful of the messages we send. Parents at the Talk Story event discussed ways to promote emotional intelligence in their children by labeling undesirable behaviors as such (hitting, name calling, etc.) so that children don’t mis-interpretthemselvesbeing wrong or bad. As we stressed during our event, children are not good or bad, though they sometimes they do good or bad things. Parents at the event reviewed ways parents can encourage the positive and discourage the negative by being clear with the children about their behaviors. Burt and Emily were initially referred toVisiting Servicestheir newborn tested positive for drugs. The couple agreed with Child Welfare Services workers that, given Emily’s drug relapse, it would be best for her to move out of the home temporarily to participate in drug treatment and other services. Both Burt and Emily expected the family to reunify after Emily had resolved her personal issues, but life intervened and Emily became involved with someone else. In the meantime Burt has been left to take on the role ofl-time caregiver for their four children. Given the daily challenges that come along with single-parenting four young children, together with the loss of his dream of resuming family life with the woman he loved, it is no surprise that Burt has accumulated high levels of stress, and this has ultimately impacted his health. But, despite his personal and health challenges, Burt does not miss a beat in striving toward his often-stated goal, which is to be the father his children need him to be. In addition to meeting weekly with his Family Support Worker for parent coaching, Burt is seeking additional help from our program’s Clinical Specialist to finally address his inter-personal struggles and question his own child rearing beliefs. In these ways he is willfully working towards improving his abilities and skills as a parent, and towards being the father his children need him to be.